Move aside, Meryl Streep, Clint Eastwood and The Bridges of Madison County. It’s Lane County’s turn to shine. With just six covered bridges, Madison County, Iowa, is merely a bit player. The superstar is Oregon’s Lane County, which stretches from the Pacific coast to the Cascade Mountains. It boasts an amazing 20 covered bridges, the largest concentration of such spans west of the Mississippi. Given the region’s prolific fir trees, it made sense to use local timber to bridge streams and rivers. The shake or tin roofs kept the steady rains for which Oregon is famous from quickly rotting the planks. As the old, often-narrow wooden structures were replaced with modern (but ugly) concrete crossings, Lane County’s covered bridges began to disintegrate. Some were lost. By the early 1980s, local preservationists were rallying to rescue the remaining score. Those pleas led to funding to restore the landmarks and turn them into tourist attractions. 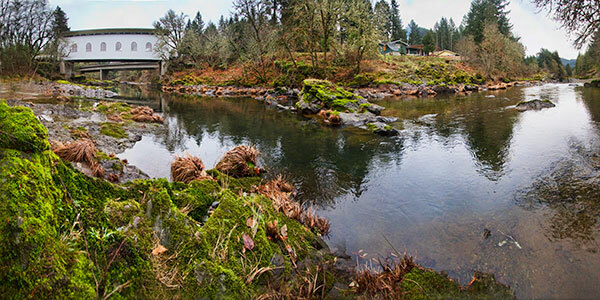 Now, Cottage Grove — called the Covered Bridge Capital of Oregon — is the ideal base for exploring the half-dozen wooden spans within easy reach. They’re accessible by car or bicycle. For folks in reasonably good shape — the ride is of moderate difficulty — the Covered Bridges Scenic Bikeway provides the perfect way to visit several bridges along a 38-mile loop around tranquil Dorena Lake. Starting out from downtown Cottage Grove, the first 17 miles of the route are along the Row River Trail, a former rail line that’s been paved over. Shortly after leaving town, the trail reaches Mosby Creek Bridge, which Allen describes as one of the prettiest and one of the most historic crossings. 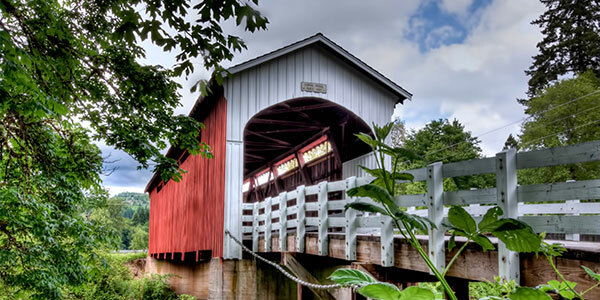 Built in 1920 in an idyllic setting, the covered bridge is the county’s oldest. One of the few still open to vehicular traffic, it was restored in 1990. A bit farther along, cyclists reach Currin Bridge, Oregon’s only covered span that is painted two colors (red and white). Erected in 1925, it replaced an earlier covered bridge built in 1883. Soon, the trail reaches the lakeshore on its way to Dorena Bridge. A picturesque spot that’s popular for weddings, the stop includes one of the Bikeway’s four rest areas. Along with Mosby Creek and Currin, Dorena is on the National Register of Historic Places. Nearby, water, sodas and snacks can be purchased in the hamlet of Dorena. Much of the route back to Cottage Grove is along Shoreview Drive. While bicycles share the road with motor vehicles, there is a paved shoulder. Just a couple of miles outside town, travelers arrive at Stewart Bridge, the last covered bridge along the Bikeway. At just 60 feet in length, the narrow, whitewashed crossing is one of the shortest. Downtown Cottage Grove — with five blocks of lovingly restored historic buildings — provides a variety of cafés at which to refuel with a fresh pastry or sandwich. Then, it’s time to make the short trip to the western edge of town to visit what’s probably the area’s most unique attraction: the Chambers Bridge. It’s also the biggest or at least the costliest, success story. One of only eight remaining covered railroad bridges in the United States, Chambers served trains hauling timber to a local sawmill. When the mill closed in 1951, the bridge spanning the Coast Fork of the Willamette River gradually but steadily began to decay. “It was in danger of falling into the river,” said Gary Williams, a lifelong Cottage Grove resident and history buff. A few years ago, as the town’s mayor, he secured $1.4 million in grants to buy the bridge from a private owner. Local residents helped pay for its rehabilitation by rounding up the payments on their water bills. The bridge reopened in December 2011 and now serves pedestrians and cyclists. “Cottage Grove is fast becoming a mecca for bicycling enthusiasts,” Williams said. Cottage Grove is located just off Interstate 5 about a half-hour south of Eugene, Ore. Delta, Frontier and United provide connecting service to Eugene’s airport (EUG) from D/FW. 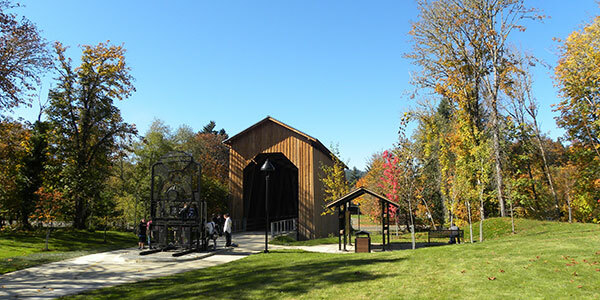 The Covered Bridges Scenic Bikeway’s website (rideoregonride.com) contains a wealth of information, including downloadable maps. Because some of the spans are still used by cars and trucks, exercise caution while taking photos. And, given the region’s climate, it’s a good idea to dress in layers and to pack a waterproof jacket.